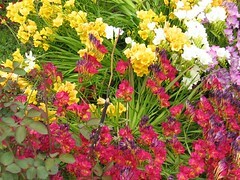 I think this is the last picture of the freesia. It’s been raining a lot for here, and the freesia that’s left has been flattened. I’m feeling better, but I’m still coughing a lot, I’m tired, and my head hurts. My husband slept in the living room and had me close my door last night because of the coughing. He said he would get more rest, including getting up with Pulguito, than if he could hear my coughing. I basted the fly shut on the Ottobre jeans, and that was it for sewing. I’ve become addicted to the games at Yahoo!Games. Hopefully, last night was the last time for that total waste of time. I had my embroidery software class this morning. Lenore didn’t show up, and she didn’t answer her cell phone when I called. That’s very unusual. I’m a little worried about her.